ORANJESTAD (AAN): Diadomingo pa 4:15’or di atardi, Polis di Noord a bay na altura di Alhambra Bazar pasobra aki tin hende di bisa. E testigo a bisa cu banda di La Cabana el a mira hende ta horta tas di turista y core bay. Nan a subi den un Toyota shinishi of un Nissan Sentra shinishi bieu. Den auto a mira cu tin un hende muher, y dos hende homber. E number di auto ta di carton. 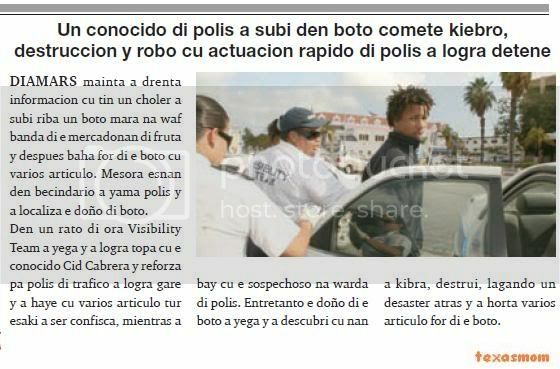 A ser splica na autoridad, cu e auto tabata core poco-poco banda di beach, y aparentemente e ta stop, y ta e muher ta baha y comete robo. Despues di a pasa man pa e tas, el a core drenta auto bek y full speed nan a core bay. Polis a bay direccion di La Cabana y worde para pa turista Mericano P.M. di 38 aña. El a bisa cu nan a horta su tas riba beach. El a bisa cu e tin testigo, esta varios OPC cu a mira. Nan a tira bista rond pero no a localiza e ladronnan. 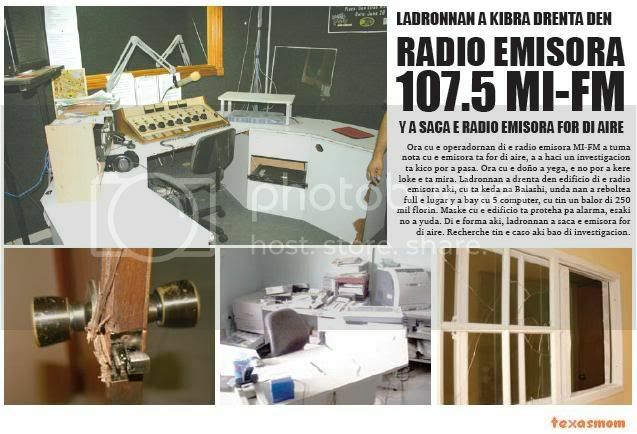 hour cu the operadornan of the radio emisora mi-fm did take notice cu the emisora is for of air, owing to on account of haci one investigacion is kico can owing to happen. hour cu the owner owing to arrive, the not can owing to believe thing the is see. ladronnan owing to enter in edificio of the radio emisora here, cu is stay at balashi, where they owing to reboltea full the lugar y owing to bay cu 5 computer, cu have one value of 250 thousand guilder. although cu the edificio is proteha for alarma, this not owing to help. of the form here, ladronnan owing to saca the emisora for of air. recherche have the caso here bao of investigacion. 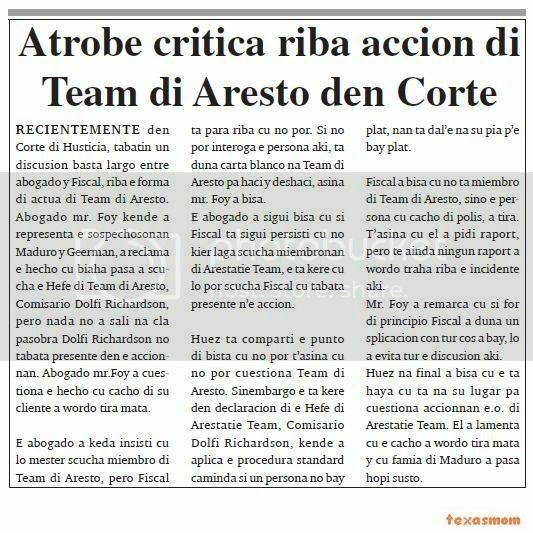 recientemente in corte of husticia, had one discusion enough largo among advocate y fiscal, on the form of actua of team of aresto. advocate mr. foy that owing to representa the sospechosonan maduro y geerman, owing to reclama the mature cu trip happen owing to listen the boss of team of aresto, comisario dolfi richardson, but nothing not owing to leave at cla because dolfi richardson not was present in the accionnan. advocate mr.foy owing to cuestiona the mature cu cacho of his cliente owing to wordo throw kill. the advocate owing to stay insisti cu will have to listen acolyte of team of aresto, but fiscal is stop on cu not can. if not can interoga the person here, is give carta blanco at team of aresto for haci y deshaci, so mr. foy owing to tell. the advocate owing to follow tell cu if fiscal is follow persisti cu does not let listen miembronan of arestatie team, the is believe cu will can listen fiscal cu was present n’e accion. huez is comparti the sharp of view cu not can t’asina cu not can cuestiona team of aresto. sinembargo the is believe in declaracion of the boss of arestatie team, comisario dolfi richardson, that owing to aplica the procedura standard caminda if one person not bay plat, they're dal’e at his leg p’e bay plat. fiscal owing to tell cu do not acolyte of team of aresto, but the person cu cacho of police, owing to throw. t’asina cu past owing to ask raport, but till still none raport owing to wordo work on the incidente here. mr. foy owing to remarca cu if for of principio fiscal owing to give one splicacion con all cos owing to bay, will owing to evita all the discusion here. huez at end owing to tell cu the is achieve cu is at his lugar for cuestiona accionnan the.o. of arestatie team. past owing to lamenta cu the cacho owing to wordo throw kill y cu family of maduro owing to happen much susto. 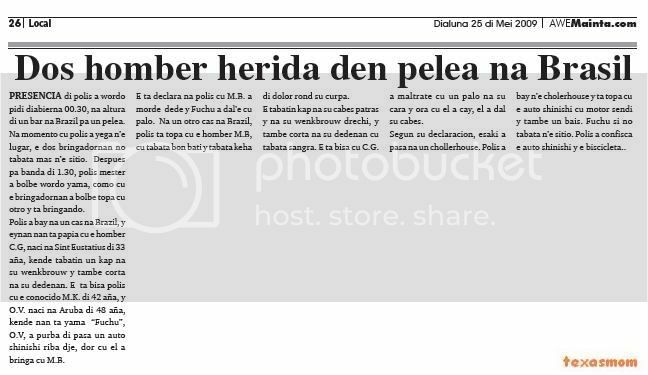 after of enough discusion, caminda at dado instant geerman owing to even angry on ponencianan of fiscal, huez owing to dicidi cu owing to base of informacionnan ricibi, do not honor the peticion of geerman p’e achieve one day pound for asisti at burial of his mother. geerman owing to ask p’e achieve saturday of 6’or of morning till 8’or of night pound p’asina can is together cu family ne ceremonia of burial of his mother, that recientemente owing to fayece at colombia y cu burial did take lugar saturday ultimo. fiscal owing to tell cu geerman is wordo considera dangerous y because; such have danger of huy. fiscal owing to tell cu will aplica the procedura of kia caminda geerman will can visit the difunto his only. geerman owing to angry y owing to cuminsa reclama y is his advocate mr. foy owing to bay calm’e. the advocate is achieve cu is important for geerman achieve one day completo pound p’asina together cu family despedi of they being keri. huez owing to tell cu the mature cu police is considera geerman dangerous for huy, is haci’e dificil for lag’e pound. huez owing to rechaza the peticion y esey owing to nifica cu owing to aplica the procedura normal cu kia have, esta the can owing to bay some hour only, but not all day y acompaña for cuidadornan of kia, cu vigilancia of police. have to tell, cu on same day here, two another preso, also owing to being compaña for atende burial of they family at same funeraria at cumana, bao of same condicionnan. saturday morning owing to enter informacion cu ladronnan owing to break the door of business of cloths, wulfsen & wulfsen y is enter steal. at arrival of the patrol policial n’e sitio, they're come across cu one security y looking at the door break. hour the owner owing to arrive n’e sitio past owing to declara cu they owing to steal the cash-register y several mercancia. this do not first trip cu is enter for steal at wulfsen & wulfsen. 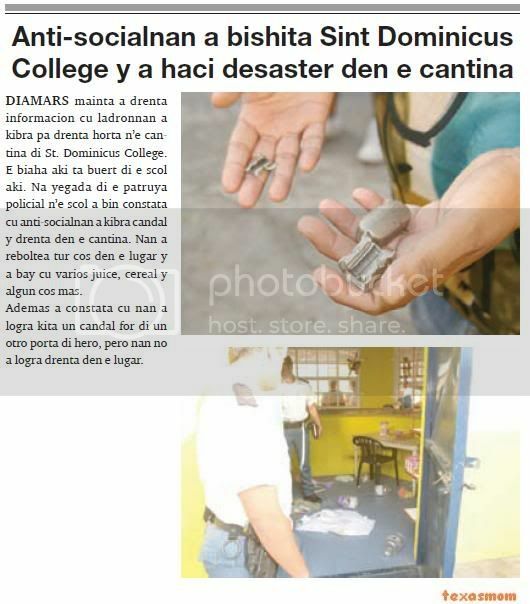 this is another business in caya betico croes, cu is victima of the cantidad of choler cu have in centro of oranjestad. presencia of police owing to wordo ask diabierna 00.30, at height of one bar at brazil for one action. at instant cu police owing to arrive n’e lugar, the two bringadornan not was more n’e sitio. after for near of 1.30, police have to owing to go back wordo calling, because; cu the bringadornan owing to go back come across cu another y is bringando. police owing to bay at one cas at brazil, y eynan they're talk cu he c.g, naci at sint eustatius of 33 year, that had one chop at his wenkbrouw y also clip at his dedenan. the is tell police cu the conocido m.k. of 42 year, y or.v. naci at aruba of 48 year, that they're calling “fuchu”, or.v, owing to try of happen one car grey on dje, by cu past owing to fight cu m.b. the is declara at police cu m.b. owing to bite finger y fuchu owing to dal’e cu tree. 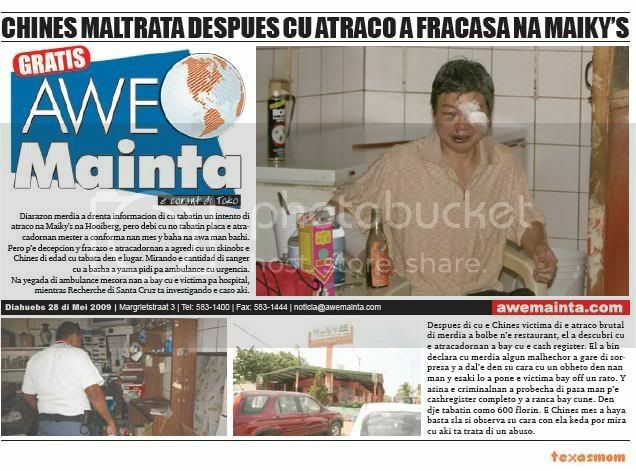 at one another cas at brazil, police is come across cu he m.b, cu was good beat y was complain of dolor rond his curpa. the had chop at his cabes behind y at his wenkbrouw right, y also clip at his dedenan cu was bleed. the is tell cu c.g. owing to maltrate cu one tree at his cara y hour cu past owing to cay, past owing to strike his cabes. according his declaracion, this owing to happen at one chollerhouse. police owing to bay n’e cholerhouse y is come across cu the car grey cu engine sendi y also one bike. fuchu if not was n’e sitio. 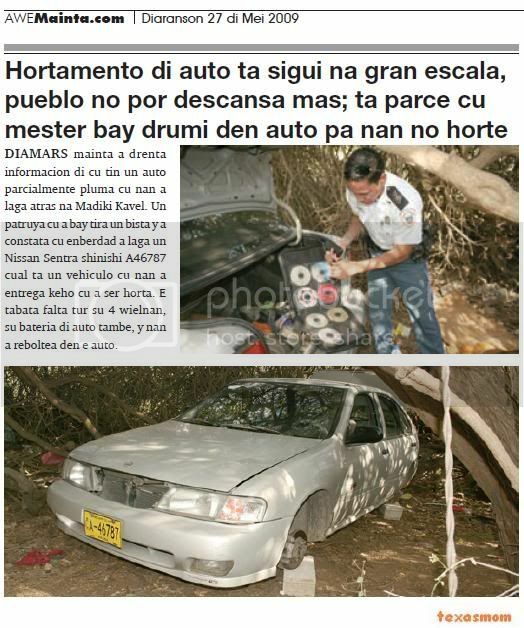 police owing to confisca the car grey y the biscicleta..
in madruga of diadomingo ultimo, among 2.30 y 7 or of morning, as is conoci, owing to break y enter in studionan of mi-fm, conocido radio emisora at balashi. cu as we owing to publica yesterday, they owing to saca the radio-emisora for of air, but also owing to bay cu several computer of much value. but now is resulta cu they not owing to bay cu computernan of dicho radio emisora only, but part abao of same edificio, is stay inter electronics, compania of the propietario of mi-fm. now is resulta cu for of inter electronics, cu porcierto is one compania cu is fix several of the luznan of trafico, the same anti-socialnan here, cu owing to achieve all time for haci they trabao, owing to bay cu one central computer cu is measure, esta ijkt, the luznan of trafico at aruba. inter electronics t’e unique compania cu can haci the trabao here, cu intermediacion of dow. the computer here is of more value still. esnan cu owing to bay cu this, is in power of one sistema, cu can is dangerous p’e self. pesey, esnan cu can know, that can have the computer, here for can please avisa autoridad policial of immediate. one witness cu owing to see one muher steal bag of one tourist at height of la cabana, is stop car of police y is notifica they locual cu past owing to see. the is tell police cu this did take lugar 4.15 of nightfall, hour cu past owing to see one muher steal one bag for of one tourist y after owing to core enter in one car diminutive grey. the is tell cu the door one toyota or one centra cu number of carton. police owing to bay near of la cabana, y eynan they're come across cu two or.p.c., kendenan is tell they cu they owing to see the muher bay cu the bag of one lady mericano. after of one rato, the tourist mericano therefore.m. of 36 year, is stop the polisnan y is tell they cu one muher owing to bay cu his bag. police owing to busca in becindario, but not owing to come across cu the car. according the two opc-nan owing to tell police cu in the car had two choler. monday afternoon one lady that recientemente owing to muda for of one apartamente owing to go back for busca his car y for his surprise owing to come achieve the interior burn. at once past owing to avisa police of locual owing to sosode y also thing the owner of the apartamentonan owing to declara. aparte of his car also had one another car cual was only on 1 wiel y the another 3 wielnan was in the interior of the car y this owing to being sendi at candela also. one takelwagen owing to being ask for take away both car for keep of police for investigacion. monday morning director of la salle college not can owing to believe the destruccion cu anti-socialnan owing to comete n’e scol. they owing to plama ink, lijm y destrui very much self. seems cu the trip here was file at la salle college. at arrival of police n’e scol, they owing to being informa of all the damage cometi. have to remarca cu esakinan is seems of is work of children of scol self. In general agreement that I March 10, 2009 (Parliamentary 31568, nr.32) have with the Standing Committee for Dutch-Antillean and Aruban Affairs, I pledged to the Court about the state of governance in Aruba. In this letter you will find my observations on the various authorities in the enforcement chain, and a reflection on the functioning of democracy. Furthermore ga I briefly reviews the state of affairs with regard to the Protocol'93 and reports of interest. 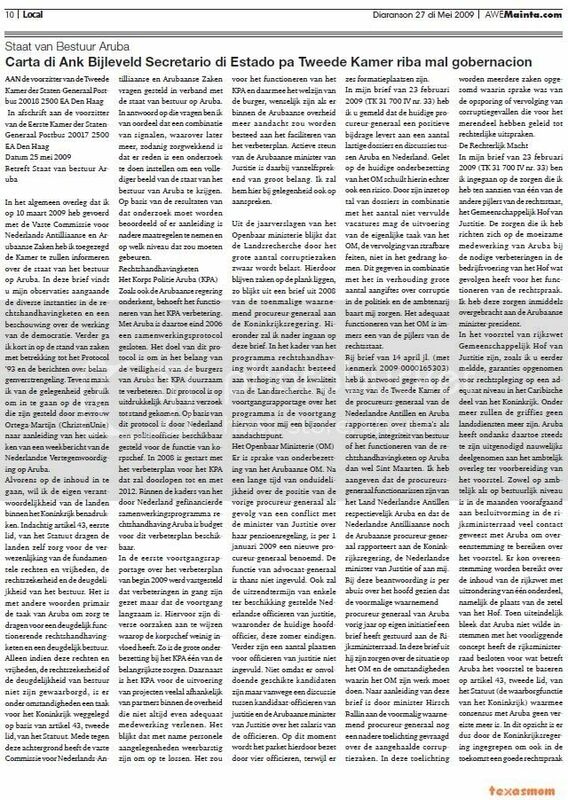 I also take the opportunity to respond to the questions set by Ms Ortega-Martijn (Christian Union) following the leak of a week of the Dutch Representation in Aruba. Before the content to go, I want the responsibility of the countries within the Kingdom of stress. Recalling Article 43, first paragraph, of the Statute, the countries responsible for the realization of fundamental rights and freedoms, legal certainty and the adequacy of the Board. In other words, it is primarily the task of Aruba to ensure a properly functioning law enforcement and governance chain. Only when these rights and freedoms, legal certainty and the adequacy of governance is not guaranteed, there is in such a task for the Kingdom to play on the basis of Article 43, second paragraph, of the Statute. Partly against this background, the Commission established for Dutch-Antillean and Aruban Affairs questions relating to the State Board on Aruba. In answer to those questions, I believe that a combination of signals, of which more later, so worrying is that there is a research institute to do a more complete picture of the state of the board of Aruba it. Based on the results of that research should be assessed whether there is further action to take and at what level that should happen. As the Aruban government has, however, the operation of the KPA improvement. In Aruba, so the end of 2006 a cooperation protocol signed. The purpose of this protocol is in the interest of safety of the citizens of Aruba the KPA sustainable improvement. This protocol is explicitly requested Aruban established. On the basis of this Protocol by the Netherlands, a police officer available for the post of chief. In 2008 started with the improvement of the KPA will continue to 2012. Within the framework of the cooperation program funded by the Netherlands Aruba law enforcement budget for this improvement is available. In the first progress report on the improvement of early 2009 it was found that improvements are put in motion but that the progress is slow. There are various causes to which the chief has little influence. Thus, the large under the KPA is one of the main concerns. In addition, the KPA for the implementation of projects often depends on partners in the government that is not always adequate assistance. It appears that especially recalcitrant human affairs are to solve. It would be for the operation of the KPA and the welfare of the citizens, are desirable if the Aruban government attention would be devoted to facilitating the improvement. 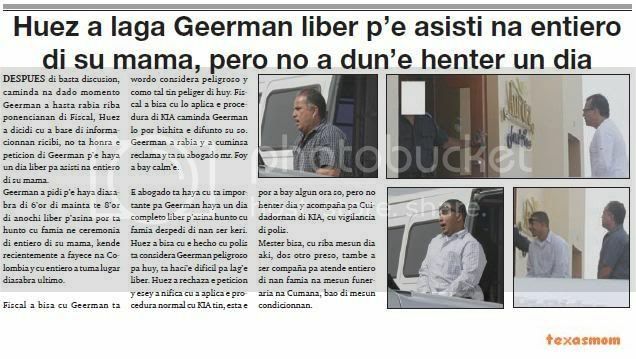 Active support of the Aruban Minister of Justice is obviously of great importance. I shall speak to him occasionally on appeal. The annual reports of the prosecution shows that the Home Recherche by the large number of corruption cases is highly taxed. This still matters on the shelf, says a 2008 letter from the then acting Attorney-General to the Kingdom Government. Below I will detail in this letter. Under the enforcement program focuses on improving the quality of the Country Recherche. The progress on the program, the progress of this for me a particular focus. There is understaffing of the Aruban OM. After a long period of uncertainty about the position of the previous Attorney-General as a result of a conflict with the Minister of Justice on its pension scheme from 1 January 2009 a new Attorney General appointed. The function of the Advocate General is not now required. Also, the broadcast period of a few available Dutch prosecutors, including the current principal officer, ending this summer. There are a number of places for prosecutors not be completed. Not because there is not enough suitable candidates but because of a discussion between candidate prosecutors and the Aruban Minister of Justice on the salary of the officers. At this moment the public prosecutor as occupied by four officers, while there are six posts. In my letter of February 23, 2009 (TK 31 700 IV No 33), I reported that the current Attorney-General makes a positive contribution to a number of difficult issues and discussions between Aruba and the Netherlands. Given the current understaffing of the OM lies are also a risk. Through his efforts in many cases in combination with the number of filled vacancies, the implementation of the actual role of the OM, the prosecution of criminal offenses, not in jeopardy. This in combination with the relatively large number of reports on corruption in politics and the civil service concerns me. The proper functioning of the OM is one of the pillars of the law. By letter dated April 14 last (Parliamentary 31568, nr.33), I answered the question of the Second Board or the state attorneys-general of the Netherlands Antilles and Aruba to report on issues such as corruption, integrity of management or operation of enforcement chain Aruba or St. Maarten. I indicate that the prosecutors are officers of the Land Netherlands Antilles and Aruba and the Netherlands Antilles or Aruban Attorney General reports to the Kingdom Government, the Dutch Minister of Justice or to me. This answer is mistakenly overlooked the fact that the former acting Attorney General of Aruba last year on his own initiative sent a letter to the Treasury Ministers. In this letter he is concerned about the situation in the OM and the circumstances in which the OM work to do. Following this letter, Minister Hirsch Ballin to the former acting Attorney-General has requested further clarification on the above-corruption cases. This note describes several cases in which there was the investigation or prosecution of corruption cases, most of which have led to judicial rulings. In my letter of February 23, 2009 (TK 31 700 IV No 33) I address the concerns I have regarding any of the other pillars of the law, the Common Court of Justice. The concerns that I focus on the difficult cooperation of Aruba in the necessary improvements in the management of the Court which has implications for the functioning of justice. I have already conveyed these concerns to the Aruban prime minister. The proposal of rijkswet Common Court of Justice, as I previously stated, guarantees for justice at the appropriate level in the Caribbean part of the Kingdom. Among other things, the land registries no services anymore. Aruba despite so be invited hardly ever participated in the official consultation in preparation of the proposal. Both at administrative and executive level in the months prior to decision-making in the realm of Ministers close contact with Aruba to agree on the proposal. There could be reached on the content of the rijkswet with the exception of one component, namely the location of the seat of the Court. When finally revealed that Aruba did not want to accept the present concept, the kingdom of Ministers decided on Aruba for the proposal based on Article 43, second paragraph, of the Statute (the guarantee function of the Kingdom) that consensus with Aruba is not a requirement anymore. In this respect there is the Kingdom Government to intervene in the future to ensure a good law. Moreover, efforts in shaping the further report yet to reach agreement with Aruba because it is the best basis for cooperation in justice. In 2007, the Committee for the Prevention of Torture and Inhuman or degrading Treatment or Punishment (CPT) visited the Kingdom of the Netherlands. 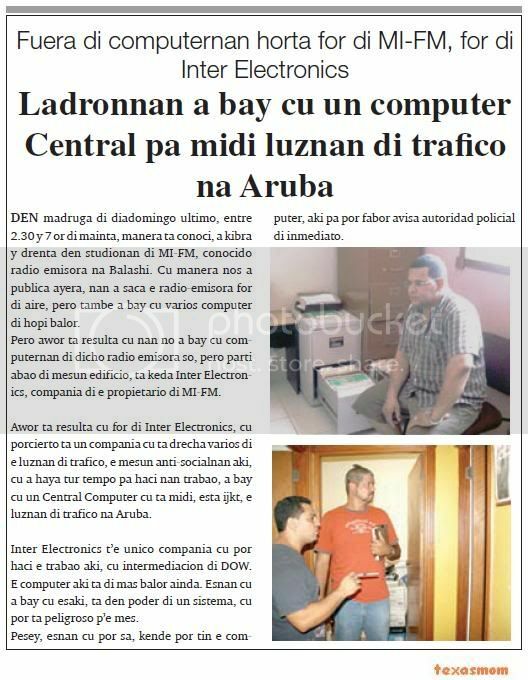 Part of the investigation of the CPT was a visit to Aruba. The report of the CPT (TK 24 587, No. 245), the government's response to this report (TK 24 587, No 321) and report on the implementation and execution of the measures to improve after CPT visit of Mr. J. Lange and Prof. mr P.C. Vegter (TK 31 700 IV, No. 34) are sent to your room. The situation in the police cells and prisons in Aruba since the visit of the CPT in June 2007 improved. The physical conditions in the two institutions have been addressed. 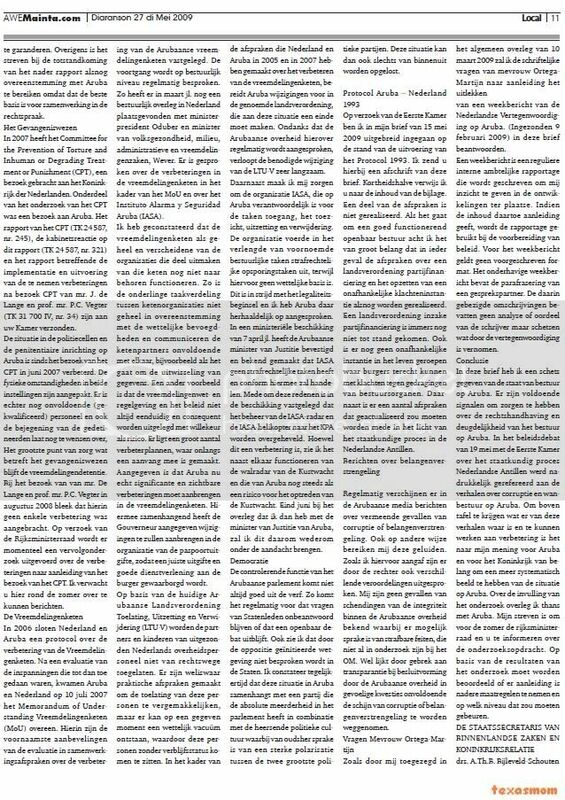 There is still insufficient (qualified) personnel and the treatment of detainees still leaves much to be desired, the biggest concern regarding the prison system remains vreemdelingendetentie. 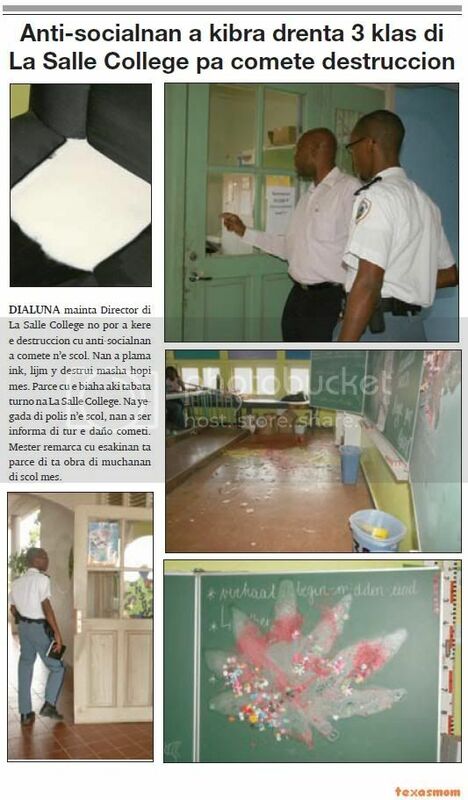 The visit of Mr. De Lange and Prof. mr PC Vegter in August 2008 showed that it no improvement was made. At the request of the Government's Cabinet is currently a follow-on improvements implemented following the visit of the CPT. I expect you here in the summer to messages. In 2006, the Netherlands and Aruba, a protocol on improving the Aliens chain. After an evaluation of the efforts so far were done, were Aruba and the Netherlands on July 10, 2007 Memorandum of Understanding Aliens Chain (MoU) agreed. These are the main recommendations of the evaluation in cooperation agreements on improving the Aruban aliens chain set. The progress is regularly discussed at the administrative level. For example, in March, still a management agreement in place with Oduber Prime Minister and Minister of Health, environmental, administrative and immigration, Wever. There was discussion on improvements in the immigration chain under the MoU and the Instituto Alarma y Seguridad Aruba (IASA). I have found that the immigration chain as a whole and several of the organizations that are part of the chain still work. For example, the division of work between supply chain organizations are not fully consistent with the statutory powers and communicate with each other lack the chain, such as the exchange of data. Another example is that the Aliens Act and regulations, and policies are not always clear and consistently interpreted arbitrarily as with risk. There is a large number of improvement, which recently made a start with it. Indicated that Aruba is really significant and visible improvements to make in the immigration chain. Related, the Governor indicated changes will make the organization of the passport issue, right issue and so a good service to the citizens is guaranteed. Based on the current national decree Aruban Admission, Removal and Disposal (LTU-V), the partners and children of expatriate Dutch public employees no longer automatically accepted. There are arrangements made for the admission of such individuals to facilitate, but may at a given moment, a legal void, so that persons without residence status will be seated. Under the agreements that the Netherlands and Aruba in 2005 and in 2007, on improving the immigration chain, prepares Aruba changes in the national decree, to remedy this situation to. Despite that the Aruban government is regularly used, is the required change of the LTU-V very slowly. In addition, I am concerned about the organization IASA, which Aruba is responsible for the tasks access, monitoring, removal and disposal. The organization claimed in a continuation of the above administrative tasks criminal investigative functions, while no legal basis. This is contrary to the principle of legality and I have since Aruba repeatedly addressed. In a ministerial order of April 7 last, the Aruban Minister of Justice and announced that no criminal IASA functions and will act in accordance with this. Partly for these reasons, the decision stipulated that the management of IASA IASA radar and helicopter to the KPA be transferred. Although this is an improvement, I see the co-operation of the walradar of the Coast Guard and those of Aruba remains a risk for the actions of the Coast Guard. At the end of June at the discussions I have with the Minister of Justice of Aruba, I will therefore once again under the attention. The controlling function of the Aruban parliament is not always well. Thus has it that Statenleden questions remain unanswered or that a lack of public debate. I also see that the opposition-initiated legislation debated in the States. I note that while the situation in Aruba associated with a party that the absolute majority in parliament in combination with the prevailing political culture which has traditionally been a strong polarization between the two largest political parties. This situation can only be solved from the inside. At the request of the Senate, I am in my letter of May 15, 2009 expanded into the state of implementation of the Protocol in 1993. I will send you a copy of this letter. Interests of brevity, I refer you to the contents of the annex (31700 Kamerstukken IV nr.E). Part of the agreement is not achieved. If it is a well-functioning public administration, I think it is important that at least a national agreement on a party and the establishment of an independent complaints body still be achieved. A national decree on party funding is not yet established. There is also no independent body set up where people could raise complaints against the behavior of management. In addition, a number of events that should be updated in the light of the political process in the Dutch Antilles. 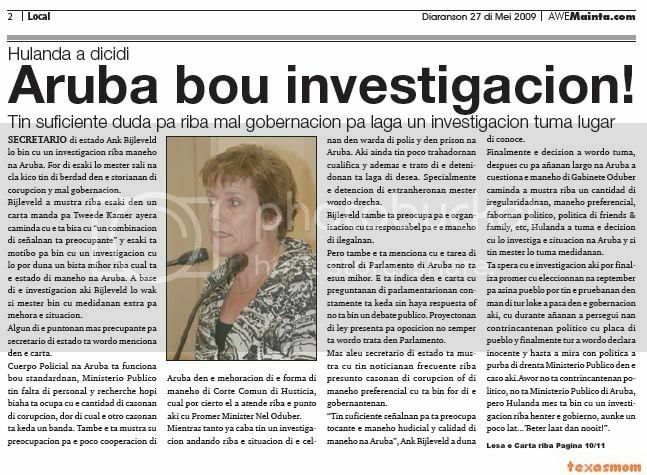 Regularly appear in the Aruban media reports of alleged cases of corruption or interest. Even otherwise reach me this sounds. As I mentioned above have been several court convictions. I have no cases of violations of integrity within the Aruban government announced that there may be cases of criminal offenses, not all research in the OM. However, by lack of transparency in decision-making by the Aruban government insufficiently sensitive issues of corruption or the appearance of interest to be removed. 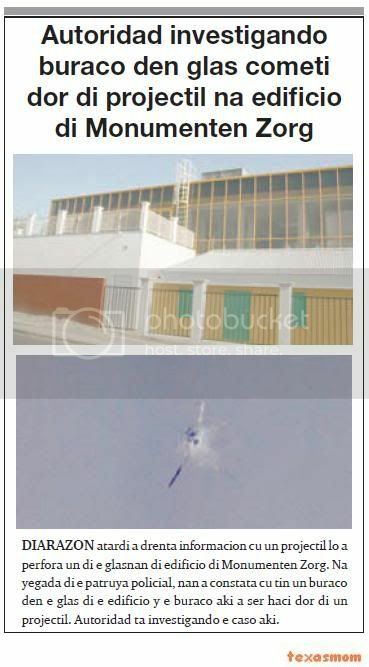 As I promised in the general agreement of March 10, 2009, I written questions from Mrs Ortega-Martijn following leakage one-week notice of the Dutch Representation in Aruba. (Submitted February 9, 2009) this letter answer. A week is a regular internal reporting official is written about me insight into developments on the ground. If the content so requires, is reported used in the preparation of policy. For the week is no prescribed format. This week includes the paraphrase of a conversation partner. Their precise definitions contain no analysis or opinion of the writer but outline what the agency learned. In this letter, I have an outline of the State Board on Aruba. There are enough signals to concerns about the enforcement and validity of the Board on Aruba. The policy debate on May 19 with the Senate on the political process, Netherlands Antilles was expressly made to the stories of corruption and mismanagement in Aruba. To top the table to get what this story is true and to work to improve it is in my opinion for Aruba and the Kingdom of interest to a more systematic picture of the situation in Aruba. On completion of the research agreement, I now Aruba. My aim is for the summer the National Ministerial Council and to inform you about the inquiry. Based on the results of the investigation should be assessed whether there is further action to take and at what level that should happen. tuesday morning owing to enter informacion cu have one choler owing to lever on one boat mara at platform near of the mercadonan of fruit y after descend for of the boat cu several articulo. at once esnan in becindario owing to calling police y owing to localiza the owner of boat. in one rato of hour visibility team owing to arrive y owing to succeed come across cu the conocido cid cabrera y reforza for police of trafico owing to succeed gare y owing to haye cu several articulo all this owing to being confisca, while owing to bay cu the sospechoso at keep of police. entretanto the owner of the boat owing to arrive y owing to descubri cu they owing to break, destrui, lagando one catastrophe behind y owing to steal several articulo for of the boat. tuesday morning owing to enter informacion of cu have one car parcialmente pluma cu they owing to let behind at madiki kavel. one patrol cu owing to bay throw one view y owing to constata cu enberdad owing to let one nissan sentra grey a46787 cual is one vehiculo cu they owing to entrega complaint cu owing to being steal. the was miss all his 4 wielnan, his accumulator of car also, y they owing to reboltea in the car. tuesday morning owing to enter informacion cu ladronnan owing to break for enter steal n’e cantina of st. dominicus college. the trip here is buert of the scol here. at arrival of the patrol policial n’e scol owing to come constata cu anti-socialnan owing to break candal y enter in the cantina. they owing to reboltea all cos in the lugar y owing to bay cu several juice, cereal y some cos more. besides owing to constata cu they owing to succeed less one candal for of one another door of iron, but they not owing to succeed enter in the lugar. diarazon afternoon owing to enter informacion of cu had one attempt of atraco at maiky’s at hooiberg, but debi cu not had coin the atracadornan have to owing to conforma they self y descend at water hand bashi. but p’e decepcion y fracaso the atracadornan owing to agredi cu one skinobs the chinese of edad cu was in the lugar. mirando the cantidad of blood cu owing to pour owing to calling ask for ambulance cu urgencia. at arrival of ambulance at once they owing to bay cu the victima for hospital, while recherche of santa cruz is investigando the caso here. after of cu the chinese victima of the atraco brutal of afternoon owing to go back n’e restaurant, past owing to descubri cu the atracadornan owing to bay cu the cash register. past owing to come declara cu afternoon some malhechor owing to gare of surprise y owing to dal’e in his cara cu one obheto in they hand y this will owing to place the victima bay off one rato. y so the criminalnan owing to probecha of happen hand p’e cashregister completo y owing to ranca bay cune. in dje had because; 600 guilder. the chinese self owing to achieve enough sla if observa his cara con ela stay can see cu here is deal of one abuse. sta. cruz -- in oranan of yesterday morning did take lugar one atraco at maiky’s at hooiberg, sta. cruz. some malhechor will owing to arrive at maiky’s y owing to ask one bit of water. at instant cu the chinese owing to become for bay coy water for her asocialnan here. the malhechornan owing to cuminza golpea the chinese cu one obheto duro till cu owing to send the chinese for of tino. after of they acto of fechoria they owing to bay cu the box of coin. they owing to bay cu more of 700 guilder cash. the chinese owing to achieve much sla at his cabez. el’a tell police cu the will not can reconoce cara of the malhechornan here. diarazon morning owing to enter informacion cu in oranan of night for morning ladronnan owing to fly enter cura of dollar rent owing to car at camacuri y owing to break enter steal y destrui 6 of they car of huur. 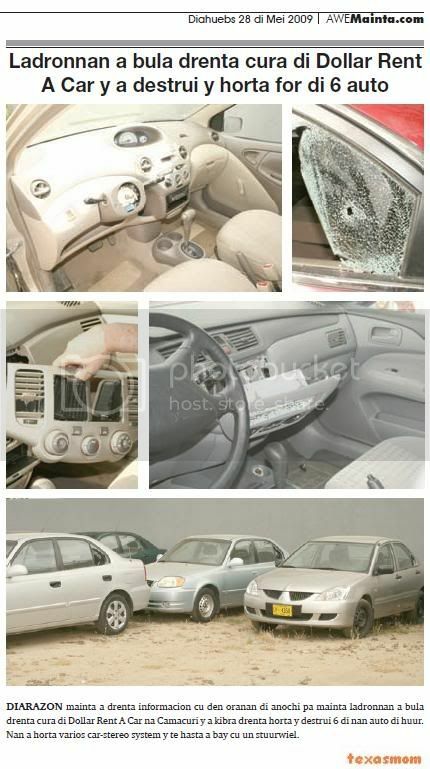 they owing to steal several car-stereo system y till even owing to bay cu one stuurwiel (steering wheel). centro of oranjestad is birando one lugar cu do not assure more. assure not in oranan of madruga. none business is assure more. the week here only, 3 business owing to become victima of kiebra of vitrina y ladronicia. yesterday was file at aruba trading, cu have rolluik, but so self, this owing to being break y the ladronnan owing to enter steal. was yesterday madruga birando morning the alarma of aruba trading in caya g.f. betico croes owing to bay on, hour cu ladronnan owing to break the glass of the door y enter inside for steal. for they owing to arrive at the door they owing to forza the rolluik y owing to happen bao of dje. unabez inside they owing to happen hand for several perfume y also they owing to happen hand in the cashregister, cloths y even lingerie. y all comentario is, adieu cu have the shelter in beach, will not have business cu will scapa of the plaga cu have. diarazon nightfall owing to enter informacion cu one projectil will owing to perfora one of the glasnan of edificio of monumenten zorg. at arrival of the patrol policial, they owing to constata cu have one buraco in the glass of the edificio y the buraco here owing to being haci by of one projectil. autoridad is investigando the caso here.